This is the second in a new series of posts about medically unexplained symptoms (MUS). The first of these, A Morass of MUS, appeared last time. However, I first looked at medically unexplained symptoms over two years ago in a post called Medically Unexplained Assumptions. In this, I travelled all the way back to the nineteenth century (just like a character from Netflix) to take a look at the case of the unfortunate Mr Le Log, who suffered memory loss, paralysis and seizures after being knocked to the ground by a speeding carriage. The accident was unfortunate of course but what made things worse for Le Log was that he had no external head injuries. He most likely had internal ones, but at that time medical science did not recognise the existence of such injuries as they didn’t have the technology to detect them. As far as the doctor who examined him was concerned, therefore, there couldn’t possibly be any physical reason for Le Log’s symptoms of memory loss etc. The doctor could only conclude that they were the result of ‘hysteria’. In the many years since then, similar assumptions have been made about many other presentations of symptoms, such as those relating to epilepsy, multiple sclerosis and Parkinsons disease, to name but a few, yet subsequent advances in technology have revealed that these conditions too are really physical in nature and have nothing to do with ‘hysteria’ at all. The habit of assuming that any condition which is not understood by doctors must be a rooted in mental health continues to this day, however. It has been shown to be wrong over and over again, and you would have thought that gradually, over the years, it would have fallen into disuse. But no. The medical profession continue to insist that they already know everything there is to know about illness, so any set of symptoms they don’t understand can’t possibly be a ‘proper’ disease – this in spite of the fact that they really know they don’t know everything, and are happy enough to admit this in other contexts. Is all this really true? Is the vast mountain of MUS that Wessely et al have brought to our attention real? Sir Simon Wessely’s presence amongst the authors of the ‘seven specialties’ paper was bound to increase my doubts about this, especially bearing in mind his favourable opinion of the calamitous PACE trial. So I was interested to take a look at how he and his colleagues arrived at their figures for the prevalence of MUS . So in other words, if the doctor hasn’t come up with an explanation for a symptom in three months, then it is officially “medically unexplained” as far as this research is concerned. The problem for me here is that, in my experience, most diagnoses take longer than three months to obtain, so this three month cut-off seems unreasonable and likely to exaggerate the extent of the MUS problem. As quoted above, the 11 “main symptoms“ correspond to “13 recognised functional somatic syndromes”. Not all of these are named in the paper but three of them are mentioned in the introduction: IBS, fibromyalgia, and – you guessed it – CFS. Well the World Health Organisation classes IBS as ‘a disease of the intestines’, and fibromyalgia as a ‘soft tissue disorder’. They have nothing to say about CFS but myalgic encephalomyelitis is a classed as a neurological condition of course and as the Department of Health apparently believes ME and CFS to be one and the same, a strong case could be made for CFS to be also classed as neurological. I can only presume that a patient presenting with the symptoms of any one of the ’13 recognised functional somatic syndromes’ mentioned would be categorised as ‘unexplained’ by the researchers. However, as the three ‘syndromes’ mentioned are in fact officially recognised as ‘somatic’ (ie physical) conditions, a case could be made that once again the number of patients with MUS are being inflated – and we haven’t even looked at the remaining so called ‘functional somatic syndromes’ yet. The chances are that some of those aren’t really ‘functional’ either. Is it reasonable of the government to recognise medical conditions as physical yet at the same time class them as MUS in the supporting statistics for a major initiative to expand services for such conditions? I don’t think it is. So where does this leave us exactly? While this isn’t all as clear as I would like it to be, I feel there’s enough here to place a big question mark against these figures. If I was relying on them to support a substantial government initiative, I think I’d want to take a very good look at them first. Likewise the supporting figures for primary care. Has anyone done so? I wonder. They may well have simply relied on peer review to validate the research, but that didn’t work so well for PACE, did it? While we’re on the subject of diagnosis: last time, I drew attention to some advice for GPs which seemed to suggest they should place undue focus on the mental health of patients presenting with physical symptoms in order not to miss any cases of MUS. If you’ve read the second of my original posts on MUS, ‘Unexplained, Misdiagnosed, Untreated‘, you’ll also know that MUS has been a substantial factor in the misdiagnosis of rare conditions, sometimes causing catastrophic delays in treatment. But there are also other concerns, most notably a gaping logistical gap which appears to lie at the very centre of the MUS strategy as it is described in the Guidelines for Commissioners (the very document which, supposedly, is supposed to kickstart the new range of services for MUS into action). I’m not sure this is really striking a realistic balance between ‘adequate examination‘ and ‘over-investigation’. It’s more like freezing to death for fear of catching fire if you light a match. The truth is that the more adequate the examination, the more likely it is to find sufficient pathology if it is present. But the guidelines stress again and again the need for less investigation. Is there not a danger of an enormous void opening up here, a void into which the physically ill may fall? Those whose pathology is overlooked by tests which turn out not to have been so adequate after all? Always assuming, of course, that they even managed to get a test. ‘Repeated tests’ seem to be especially frowned upon by the guidelines, so if you’ve been tested before, you may not get another chance. The impression given, rightly or wrongly, is that the NHS will no longer cater for patients who develop pathology for which they’ve previously been tested. Unless you want CBT of course, in which case your brand new local MUS clinic will be happy to help. This is especially concerning in the light of the guidelines’ acceptance that ‘MUS may be caused by physiological disturbance, emotional problems or pathological conditions which have not yet been diagnosed’. (My italics.) For if that is indeed the case, there’s a problem, isn’t there? With all this desire to avoid investigation, how are these conditions which have not yet been diagnosed going to get diagnosed – especially once a patient has been judged to have MUS? I can find no answer to this important question in the guidelines. But it is a life-threatening question and surely one which requires an answer…. I’d like to complete this post with a brief overview of the current situation, as regards both MUS and IAPT. The underlying principles behind the original IAPT scheme seem to me to be praiseworthy: delivering therapies for mental health problems such as anxiety and depression which previously all too often went untreated. There are concerns, however, especially regarding the expansion of IAPT to include MUS and long term conditions. The official guide to this new ‘care pathway’, for instance, cites CFS as a MUS condition, repeating the error from the ‘seven specialties’ paper but this time in a government document; while IAPT as a whole is also under scrutiny following an audit by Michael J Scott which suggests that the therapies used (principally CBT) come nowhere near achieving the 50% curative rate which is claimed for them. This concern is covered in detail in the latest issue of the Journal of Health Psychology (ed David F Marks). As for MUS, if we stand back and look at the overall picture of that, is there even greater cause for concern? Not only must we have the same worries about the efficacy of the therapies, surely questions must be asked sooner or later about the vast numbers which are supposed to be affected by this phenomenon and the effect on the diagnosis of physical/somatic conditions if undue emphasis is placed on it. Put in a single sentence, the question is this: do we have a situation where a massive new initiative is being rolled out to promote therapies with exaggerated efficacy for the purpose of combating an imaginary epidemic, at the same time encouraging doctors to overlook and under-investigate genuine pathologies? 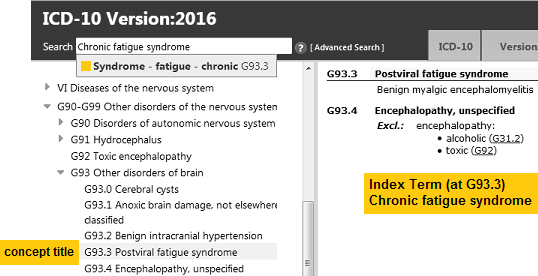 In ICD-10, CFS is included in Volume 3: The Alphabetical Index, where it is indexed to G93.3. CFS takes the same code as PVFS and BME. For ICD-11, Fibromyalgia has been relocated under the Symptoms, signs chapter as an inclusion under “Chronic widespread pain” under new category, “Chronic primary pain” in a new “Chronic pain” category block. Which means that for ICD-11, FM is no longer discretely coded for in the “Diseases of the musculoskeletal system or connective tissue” chapter, but rolled up as an inclusion of “Chronic widespread pain” and takes the CWP code and it is CWP that is coded for in the ICD-11 MMS Linearization – not Fibromyalgia. For ICD-11, IBS is classified under Chapter: 13 Diseases of the digestive system, under parents: Diseases of the digestive system > Functional gastrointestinal disorders. The IASP Pain working group has suggested IBS should be secondary parented under “Chronic primary pain” in the Symptoms, signs chapter. MUS, PPS services and IAPT integration into NHS primary care – what’s happening across the UK? Thanks for setting me straight, Suzy, both here and on Twitter. I’m sorry I’m not always as precise as I’d like to be – though I think I’m a lot more accurate than certain ‘researchers’ are! Seriously though, I must take a few days out and get up to speed with this stuff. Thanks too for the link to the PR thread. Once again, a timely, chilling commentary about the direction of travel of the NHS, including the privitisation of services for medicine. One of the problems highlighted by Stephen Holgate many years ago was the lack of speciality consultants. “1.2 Neurology in the UK is much smaller than in the rest of the world—in the UK there is on average one neurologist per 150,000 population as compared to 1 per 25,000 in the rest of Europe. Services for neurological conditions are poorly organised and do not meet patients’ needs, says a report. So there you are: create “MUS” and redirect from specialisms like neurology, reclassify all manner of chronic conditions as “Functional disorders” and allow neurolgy to expand and blossom by applying for the new promised monies from government. Sorted……!! A stroke of genius then – they’re just making best use of their staff. Entirely blameless! Many years ago, a doctor friend of ours used to say that the NHS is run for the convenience of doctors. Sadly, it seems to be more true now than ever. Mental health: how many psychiatrists in the EU? Print Mental health: how many psychiatrists in the EU? Mental health care is a specialised area of medicine. In 2015, the European Union (EU) had around 90 000 psychiatrists in total. The majority practised in Germany (18 200 psychiatrists, or 21% of the EU total), France (15 200 psychiatrists, 17%), the United Kingdom (11 800 psychiatrists, 14%) and Italy (10 800 psychiatrists, 12%). However, to be able to compare the shares by country, these absolute numbers need to be adjusted to the size of the population. Please be aware that the data are not fully comparable due to differences in reporting between Member States. Eight Member States recorded over 200 psychiatrists per million inhabitants. These were Finland (with 236 psychiatrists per million inhabitants), Sweden (232) the Netherlands (230), France (228), Lithuania and Luxembourg (both 225), Germany (223) as well as Greece (219). At the opposite end of the scale, nine Member States had fewer than 150 psychiatrists per million inhabitants. The lowest rate was recorded in Bulgaria (with 76 psychiatrists per million inhabitant), followed by Poland (90), Malta (95), Spain and Romania (both 106), Cyprus (112), Portugal (120), Slovenia (128) and the Czech Republic (146). I think that Wessely’s ‘MUS’ could prove to be as damaging to patients as Wakefield’s giving birth to the antivax movement. His whole career seems to follow the theme of promoting the belief that the GP system is infallible at detecting and diagnosing all diseases within a short period of time with a minimum number of simple tests. Even a cursory read through a history of diagnosis shows how fanciful this theme is, yet Wessely is taken seriously over and over again and his ideas have become dominant in the NHS. Where there would be no shame attached to having a genuine category label for as yet undetermined illnesses, as an indicator of how much diagnostic practice still needs to be improved, Wessely has turned the meaning of ‘MUS’ on its head: just as ‘UFO’ now means ‘flying saucer’, and ‘should not be investigated further because these aren’t real’, whereas it originally meant ‘unidentified flying object’ and demanded proper investigation, because it might have been evidence of enemy activity; so now Wessely has made ‘MUS’ just another synonym for ‘hysteria’, and he actively discourages investigation of any condition that does not quickly yield to simple tests. Anyone with half a brain cell still functioning can see the pitfalls and dangerous fallacy of this approach, but we’ve seen it infecting more and more of the NHS over the last few decades of lobbying from Wessely and like minded individuals, now backed by influential industry lobby groups like SMC. As ‘austerity’ cuts continue to bite, this approach has greater and greater appeal for cash strapped CCGs who don’t want to spend on ‘too much testing’ (another favourite theme among medical journal letter writers). The result will, inevitably, be a great increase in the number of patients simply swept under the blanketing rug of ‘MUS’ and forgotten for the rest of their lives–deprived of their fundamental human right to health on the say so of Simon Wessely. Some time ago there was a Lancet Neurology piece, that pointed out that as many as 1 in 15 of humanity has a rare disease. This means that, though any particular rare disease might not be seen by a GP very often, he will actually be dealing with people with rare diseases *all the time*. This knowledge alone should put Wessely’s redefined hysteria straight into the loony ideas bin. But still it keeps getting more and more lobbying effort to push it forward as a panacea for all the NHS’s ills. Yet we actually need exactly the opposite of what Wessely is suggesting: We need a one stop Diagnostic Service of experts in all fields, to which all those cases which individual GPs and consultants cannot solve on their own, can be referred [Could call them SERs for ‘Special Effort Required’.] This team working approach, I’ve noticed, does seem to happen to some extent in the US (where more tests make more money…) but it is almost unheard of here, despite everyone knowing that multisystem illness is common–especially in the elderly. In the future ‘Muser’ will be as reviled as ‘Antivaxer’, and, until that is the case, more and more people will be suffering, chronically and unnecessarily, both physically, and from the mental abuse of deliberate disbelief and disrespect of those they have to rely on for help. Some will die never knowing what was wrong and still being suspected of malingering; some will see no way out but suicide.